ACT TWO - The same scene. Samson, Manoa, Micah and Israelites. One of Handel's most popular oratorios during his lifetime, composed within weeks of messiah. 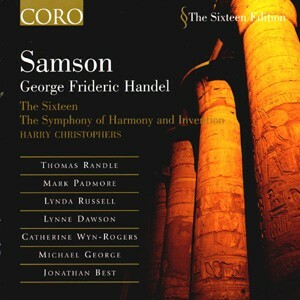 Samson proved to be one of Handel's most popular oratorios during his lifetime, composed within weeks of Messiah. Thomas Randle sings a commanding title role ("Samson with attitude...: The Independent), with Lynda Russell's vocally seductive Dalila, and Catherine Wyn-Rogers' rich and expressive Micah. Samson opens with a pagan festival and closes with an elegy. Its finale is rightly established as one of the most famous arias of all time" "Let the bright Seraphim in burning row/ Their loud, uplifted angel-trumpets blow."